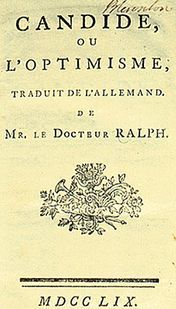 François-Marie Arouet was the name of the French writer who, once fame came to him, invented his own anagram-nom de plume, Voltaire. 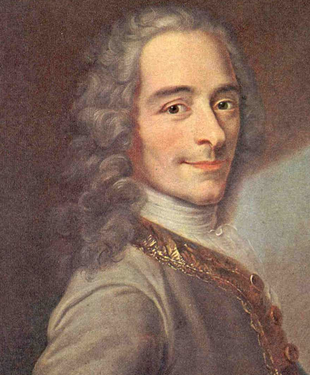 Born in Paris in 1694, Voltaire was the son of a notaire (lawyer or solicitor) and a Frenchwoman of noble birth. His education in a Jesuit school trained him to think clearly and sharply, to analyze logically, and to question authority, perhaps to such a heightened degree that his questions cost him early and dearly in his life. The Jesuits, or the Society of Jesus, have traditionally taken up the mantle of being the rebels and soldiers of the Roman Catholic Church. Young François-Marie perfectly fit their mold. He was an ardent artistic apostle who, in spite of his father’s wishes, quickly and facilely found his way into arts and letters. Rebellious, witty, amorous, Voltaire wasted no time in making Paris the epicenter of his revolts against authority which, in those days (as in the here and now), meant religion and government. With great success and great daring, he poked fun in piercing mocking verse that was aimed at the French Regent; this person was the nephew who held the reins of power after the death of Louis XIV and before Louis XV became King. Voltaire even dared to pointed the accusatory finger toward royal scandal! He consequently found himself first exiled from France and then tossed in the Bastille for a year. Prison was quite a shock to this young, fiery, creative artist. He nonetheless put his period of confinement to good use: He wrote his first play, Œdipe. It was, of course, a success. The play established his literary reputation and it nicely sufficed for a bit of revenge against his royal captors. 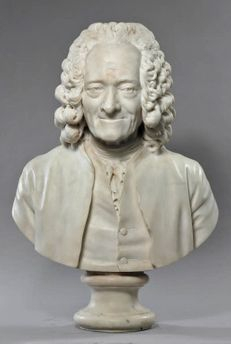 Voltaire thereafter placed his career and his life on a steady collision course with the French monarchy, religious authorities, in sum, with conventional thinking. This last modality had to be challenged by this French writer simply because it existed! 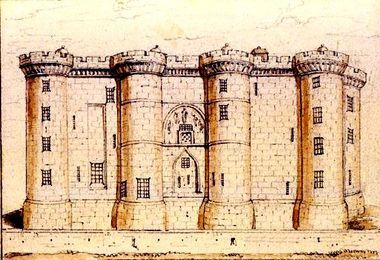 After his imprisonment in the Bastille, this Frenchman of robust talent and wit took the necessary but bold step of making a formal break from his family and from the past which had, in essence, formed him. The next crisis was nearly inevitable, nearly predictable: romance. Voltaire fought not just with a nobleman, but a high nobleman, the Chevalier de Rohan in the dressing room of a famous French actress, Adrienne Lecouvreur (one cannot make up such intriguing names!). Voltaire challenged Rohan to a duel. The challenge was, bien sûr, accepted. Voltaire quickly took some fencing lessons! Perhaps Rohan was uncertain of the swordsmanship of this writer. Perhaps he thought Voltaire was calling his bluff. Perhaps he simply was insulted by the mere idea of a lesser man (a playwright, a poet, the son of a notaire) challenging him to a duel. In any case, Rohan decided not to make use of the sword but to hire half a dozen heavies to beat up Voltaire in the street! The French authorities came to the scene. They were immediately alarmed. They arrested -- Voltaire! The French writer was released only on the condition that he leave the country. Voltaire thus found a home in England. For three years (1726-1729) he wrote prodigiously; made friends with all the leading intellectuals, the movers and shakers that France so obviously lacked; and he became more wealthy, more famous, and perhaps even happy. He nonetheless was a Frenchman and he longed for France. In 1729, his return to his native land after exile in England was one of triumph for him, marked with popularity that would soon evade him. Voltaire was an extroverted intuitive type who could not stay long in one place; during whatever time he stayed in one location, his effervescence of expression endangered his freedom -- the one ideal that he sought with almost religious fervor. 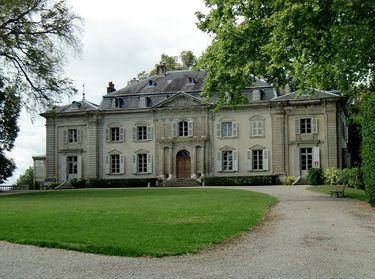 The remainder of his life consisted of a shuttle to Prussia, an attempt to return to France (denied), and a final retreat from 1759-1778 to Ferney, a village located on the edge of Switzerland but in French territory. There, Voltaire built a chateau, founded small businesses for artisans, and he grew, not old, but ever more forceful. He became, in essence, the father of Ferney. He counted his enemies, including the Catholic Church; and he counted his friends: outcasts, leaders, the oppressed, the refugees of true persecution, the sort of victim that the modern world has unfortunately come to forget while it invents victims for publicity and for political purposes and, most appallingly, for profit. Voltaire wrote and he thought; he thought and he wrote. Voltaire could not walk the earth without a thought to pen, an idea to ponder, an injustice to analyze and try to fix in terms of literary art. He wrote, “Quand on est jeune, il faut aimer comme un fou; quand on est vieux, travailler comme un diable.” When we are young, it is necessary to love like a madman; when we are old, to work like a devil. Voltaire accomplished both requirements in his lifetime. When he was young, he loved like a madman and was sent to England to pay the price for his love and his folly. When he was old, after an absence of twenty years, at eighty-four years of age, he returned to Paris in February 1778 to see the opening of his new tragedy, Irène. He had perhaps worked like the devil to be able to see this play. Having witnessed its realization, he died soon thereafter in May. Accounts of his death vary widely. Some stories are partly accurate. This skeptical circumstance comports well with the philosophy of a man who did not wish to become a cynic but who was always somewhat hesitant to settle upon absolute truth. Any principle that ultimate might smack of too much authority. Voltaire was officially denied a Christian burial but, claiming not to know of this decision, friends buried the Frenchman at the Abbey of Scellières in Champagne. The National Assembly of France, which Voltaire would undoubtedly have mocked in some fashion, made things right in July 1791. 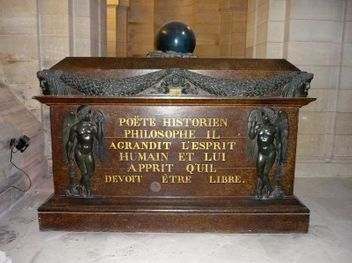 They directed his remains be returned to Paris for enshrinement in the Panthéon. It was an elaborate ceremony, complete with the procession of a million people throughout Paris -- this scene would have amused — “une mille de fois” — François-Marie Arouet. The skeptic was born in the man but the scintillating wit evolved over time as a result of the life that happened while he was happening to life. It is rare for a man of letters to have taken part so fiercely in life, but Voltaire accomplished almost every literary form because he achieved quite absolutely almost every emotion that a man dares to know. He was brave and he was brilliant. He wished to build a world based upon reason while, at the same time, his thoughts burned with passion. Contrary to authority, he knew only the authority of his own innovative, inventive mind. François-Marie Arouet was quite the Frenchman, carving out an era that became known as the Age of Voltaire. The era awaited him, just as surely as he waited for his time.